Mildreds has an entirely vegetarian menu, with plenty of vegan options to boot, which are all clearly marked. 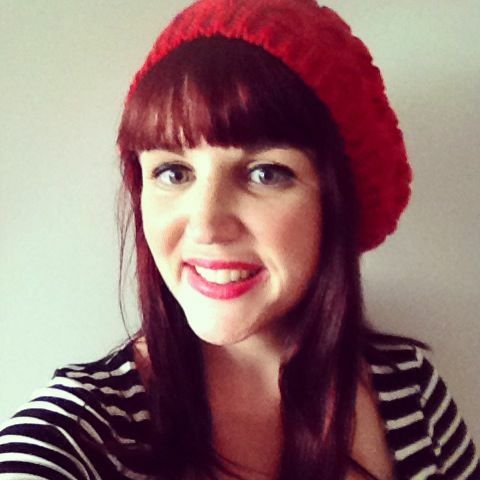 The menu is designed to be shared and is split in to starters, mains, burgers and puddings. 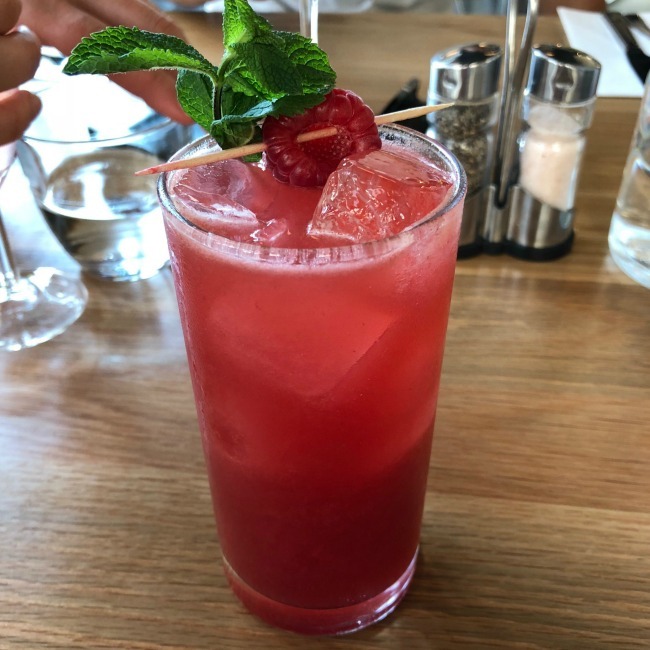 We kicked things off with a round of cocktails – I went with the Raspberry Fizz (£7.5) which was refreshing after what had been a hot London day. 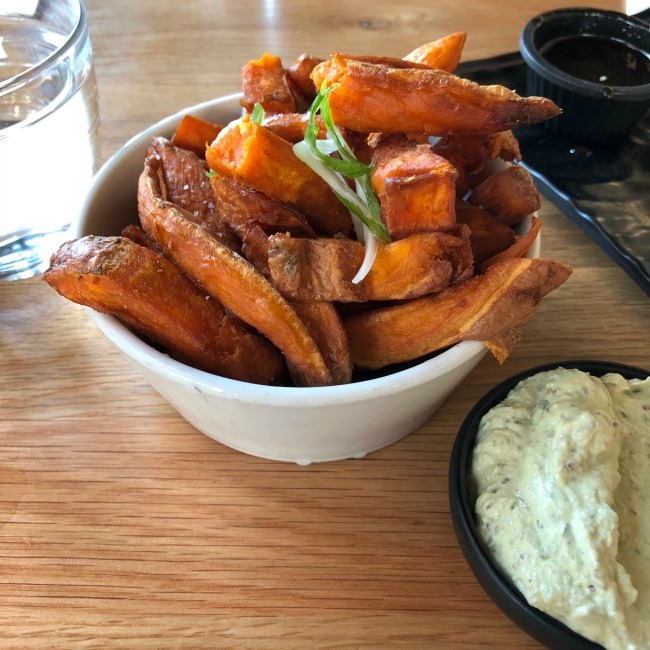 On the food front we ordered the twins favourite – sweet potato fries with basil mayo (£4) which were a delicious way to kick things off. The dipping sauce was particularly excellent, although the girls hijacked most of it! 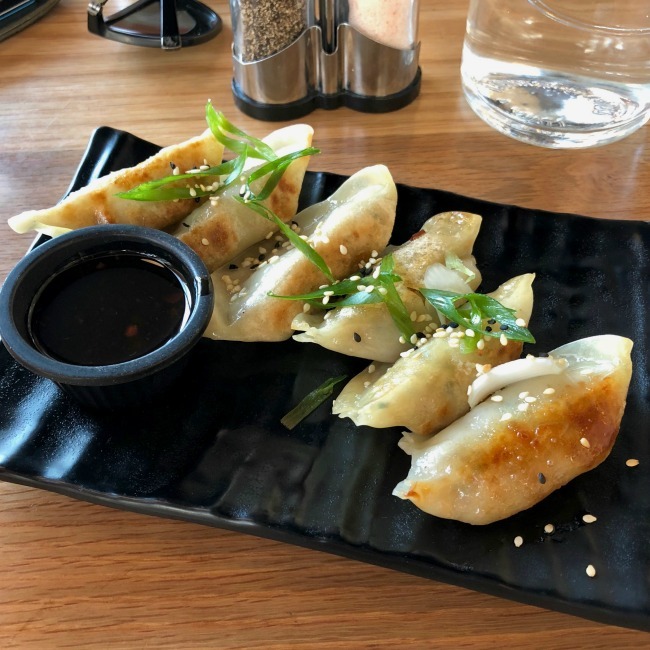 We also started with a serve of the gyoza (£6) which were well cooked, filled with a tasty combo of vegetables and had great thin skins. The chilli-soy dipping sauce was also great, and we got to keep this one to ourselves! For mains we ordered three dishes to share, and it was hard to narrow it down to just that! 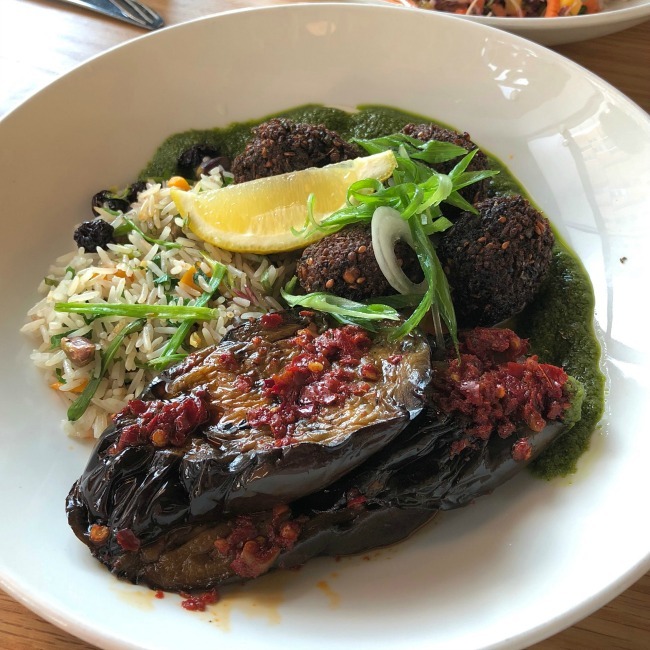 The first was the green falafel dish (£12) which came with eggplant, sour cherry rice, harissa, basil oil and tahini sauce. These were some of the best falafels I’ve ever had – full of flavour, not at all dry and served with such an interesting combination of ingredients. 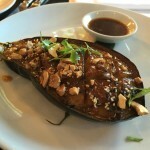 The eggplant was also a standout, as was the combination of spicy and creamy sauces the dish came with. So good! 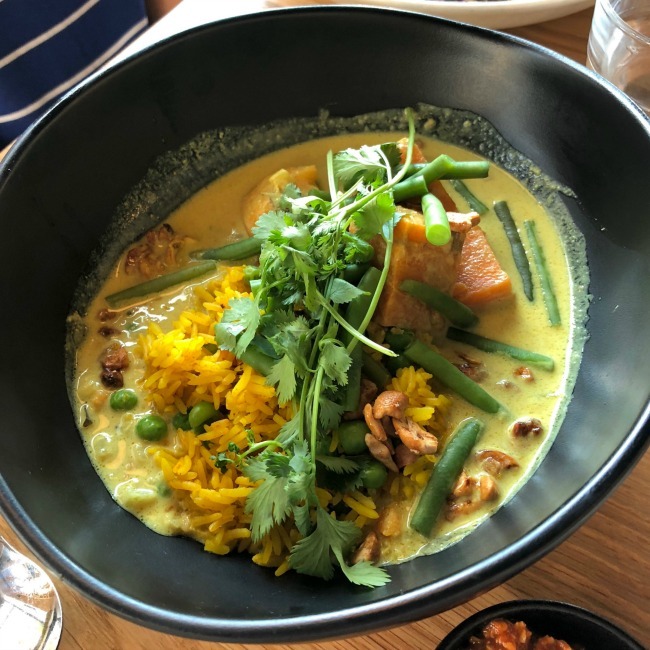 Next up was the Sri Lankan curry (£13) which consisted of sweet potato, green beans, toasted cashews, pea basmati rice and a coconut tomato sambal on top. 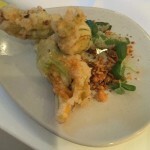 This dish was creamy, had a good kick of heat to it as well as a delicious crunch from the cashews. I’m always a fan of a sweet potato curry and this was no exception – another excellent choice. 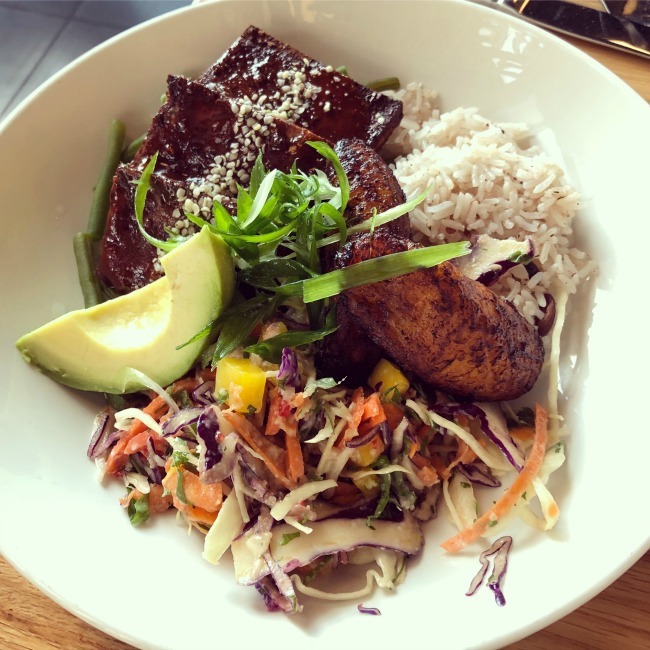 Our last dish of the night was the Caribbean jerk tofu (£13), which was served with coconut rice and peas, mango slaw, hemp seeds, avocado and fried plantain. This was possibly my favourite dish of the lot, although it was hard to separate them. Plantain is not a vegetable I eat very often but it was absolutely delicious. The sticky tofu was the star of the show though and worked so well with the fresh, crunchy slaw. An absolute winner of a dish. Overall we had a delicious meal at Mildreds in Dalston and it was an excellent way to cap off my ultra short stop in London. 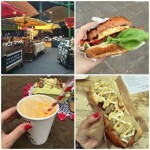 They have a total of four venues in London (Soho, Camden, Kings Cross and Dalston) so it’s well worth a visit! Have you eaten at Mildreds before?